Ever since the $400 million casino proposed by the Wilton Rancheria Elk Grove burst into public conscientious, Mayor Steve Ly and his City Council colleagues have been careful not to voice their position publicly. Documents released as part of the Bureau of Indians Affairs recently released Records of Decision, however, paint a different picture. Instead, Ly gave a full-throated endorsement of the proposed casino. 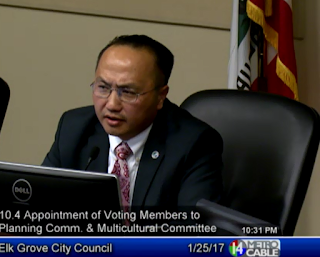 On page 79 and 80 the report says "Finally, the Department has received several phone calls in support of the Tribe's application, including one from Steve Lee [sic], the Mayor of the City of Elk Grove." According to footnotes, Ly left voicemail messages on January 17, 2017, with Principal Deputy Assistant Secretary-Indian Affairs Lawrence Roberts. The report goes on to say that on his and the entire City Council's behalf, Ly said "the City Council is "completely behind" the trust application and has unanimous support." It is not known if the unanimous support includes Councilman Pat Hume, who has recused himself from most of the deliberations related to the casino. Ly did not respond to an email request seeking comment on his remarks of support for the entire City Council noted in the BIA report. Also submitting comments to the BIA was Ly's mentor, former Elk Grove Mayor Gary Davis who, according to the report said "provided his support for the trust acquisition and remarked on the strength of the Tribe's relationship with the City." As recent as last Wednesday, Ly, and the Elk Grove City Council were asked at their regular meeting to state their stance on the casino. During public comment, Elk Grove resident Yolanda Carrillo asked the four councilmen point blank about their positions. "I would like to know where all of you stand," Carrillo said. "If you're for it, all my talking in the world is not going to change your mind. When do we get to know if you oppose it, or are for it." The casino issue has placed Ly, a first-term mayor who is frequently at odds with his City Council colleagues on a host of other issues, in something of a political landmine. While there seems to be a slim majority of Elk Grove residents in support of the gaming venue, a vocal group of residents has made sure the Council has consistently heard their voices of opposition. Additionally, a widespread media campaign using online, TV and radio commercials has been launched by a group called Council on Prosperity and Accountability (CPA). The CPA accused Ly and the City Council of conducting backroom deals with the Wilton Rancheria and has warned about increased crime, prostitution and DUI arrests should the casino open and ask Elk Grove residents to contact Council Members urging the City not to support the project. This political landmine Ly stepped into first became apparent during last fall's general election when the casino issue was heating up. At the time Ly sent a mailer saying that as a father he opposed gambling, but as an elected official he supported the casino on economic development grounds. That mailer was rated "iffy" by the Sacramento Bee's PoliGRAPH scale. That split personality of the issue presents an enormous risk in terms of governance and politics for Ly and the City, says one political consultant. "Credible polling shows the issue splits the community, and that those who oppose the Casino are much more passionate," Tab Berg of Tab Communications said. "I think it is unfair to assume Ly’s effort to be on both sides of the issue is calculated scheming; but the public will still see it as opportunistic waffling or outright lying, while proponents will recognize that he is an unsteady partner." Additionally, Berg said Ly's positioning on the matter could also impede other city initiatives. "That will weaken him as Mayor and undermine his ability to rally the City to achieve other goals," Berg added.